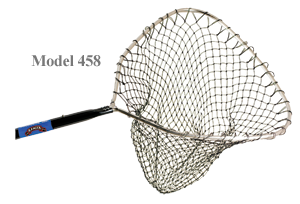 Ranger Ruler is optional on all crimped-style fixed-handle nets. 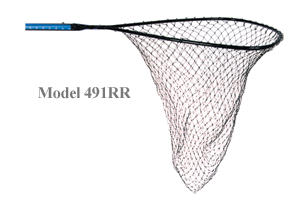 One of our most popular landing nets. Perfect for Walleye, Bass and all other mid-sized fish. Black anodized hoops and octagon handles guarantee perfect alignment of the snap button every time you extend the handle. They have flat-bottom rubberized nets with an accurate measuring ruler. 1-1/8″ octagonal telescopic black anodized aluminum handles with automatic alignment push button and sturdy 1/2″ hoops. Or 1″ round diamond-embossed black anodized aluminum handles with sturdy 1/2″ hoops.